Hirniak, Justyn [Юстин Гірняк] – priest of the Ukrainian Graeco-Catholic Church (UGCC), active in community affairs; born on 11 February 1877 in Buchach (Ternopil oblast, Ukraine; at that time – Austrian crown land of Galicia); died on 16 July 1958 in Ramey, Pennsylvania, USA; buried in St. Mary’s Ukrainian Catholic Cemetery, Fox Chase, Philadelphia. On completing his theological studies in Lviv, on 1 September 1899 Justyn Hirniak was ordained a priest. From September 1899 to January 1902 he served as assistant priest in the UGCC parish in the village of Hvizdets (now in Ivano-Frankivsk oblast). He then briefly worked as a teacher of religion in schools in Kolomyia, before returning to pastoral work at the beginning of 1903 as parish priest in the village of Tiaziv (Ivano-Frankivsk oblast). From 1912 he taught religion in Stanislav (now Ivano-Frankivsk, Ukraine; Stanislav in 1772-1918 and 1939-1962, Stanyslaviv in 1918-1939). He was an external doctoral student of the Vienna University Faculty of Theology, but was unable to complete his doctorate owing to the outbreak of the First World War. During the war he provided pastoral care in several villages which had been left without priests, and in 1915 was appointed Dean of the Yezupil deanery (Ivano-Frankivsk oblast). In 1920 he settled in the village of Yamnytsia (now one of the largest villages in the Ivano-Frankivsk oblast) where, in December of that year, he became the parish priest. In 1928 he was appointed a counsellor of the Stanislaviv eparchial (diocesan) consistory. In 1932 he became Dean of the Stanislaviv deanery and an honorary canon. In Yamnytsia he was also a leading figure in the community. He initiated the revival of the local Prosvita society (established in 1896) and served as its first head. He was also one of the founders (in 1929) of the local branch of the Sokil physical education society, and mentor of the local group of the Plast Ukrainian Scouting Organisation. He was active in various Ukrainian organisations in Stanislaviv, and was a member of the Lviv-based Theological Scholarly Society. In June 1944 he left for a holiday in the Lemko region, from where he did not return to Yamnytsia owing to the Soviet advance on Western Ukraine. He made his way via Czechoslovakia to Austria, finally arriving in Innsbruck in 1945. By the authority of the Roman Catholic bishop of Innsbruck he was appointed dean of all the Ukrainian displaced persons camps and parishes in Tyrol. He himself served as the UGCC parish priest in Innsbruck, where he also became head of the Brotherhood of St. Andrew. Later he lived briefly in Mittenwald, Germany. As a result of efforts by Bishop Ivan Buchko, the apostolic visitor for Ukrainian Graeco-Catholics in Western Europe, in 1948 the Rev. Hirniak moved to the United Kingdom to work as a priest in the Ukrainian Catholic Church (UCC) in Great Britain. 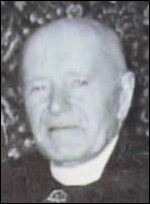 From 1948 to 1951 he was the UCC parish priest in Rochdale, North West England. Through his efforts the parish was granted sole use, for a minimal rent, of a local Roman Catholic church and priest’s residence and office. In 1950 he jointly initiated (with Maria Lukianenko) the setting up, in Rochdale, of the first Ukrainian Saturday pre-school nursery in the UK and was its spiritual mentor. In December 1951 he left England for the USA, where he served as assistant priest in New Haven (1951-56) and Philadelphia (1957-58), and was the spiritual mentor of Plast in the USA. His publications include: Korotka bibliina istoriia Staroho i Novoho Zavita (A short bible history of the Old and New Testaments; Stanyslaviv, 1930), Plan navchannia relihii v narodnykh shkolakh (Curriculum for religious instruction in primary schools; Stanyslaviv, 1932), Malyi katekhizm khrystyiansko-katolytskoi relihii (Minor catechism of the Catholic Christian faith; republished: Leuven, 1946), and various articles in the Ukrainske zhyttia (Stanyslaviv) and other newspapers in the 1920s-30s. In the final years of his life he was working on a dictionary of Old Church Slavonic, which he had begun to compile in 1941.